Easter Special offer - 15% OFF for all our Easter embroidery designs. Valid for orders of minimum USD 5. Earn bonus points: When you make a purchase on our web site you earn 1 bonus point for each US Dollar. The bonus points are calculated and added to your account when the order has been completed. Based on amount of bonus points earned, you will become eligible for discounts of up to 7 %. To participate you must be a registered user and log in to your account when ordering. 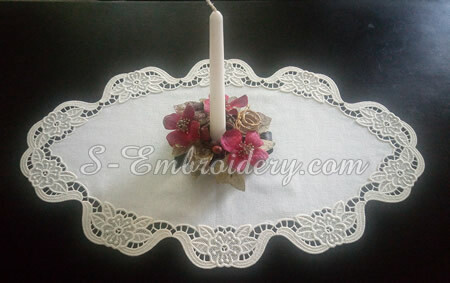 A fine free standing lace ellipse doily machine embroidery. 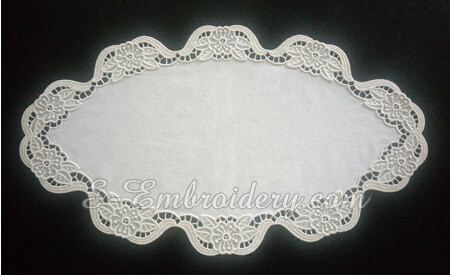 The size of the ready doily will be approximately 24.4 x 14 inches (62.1 x 35.8 cm). 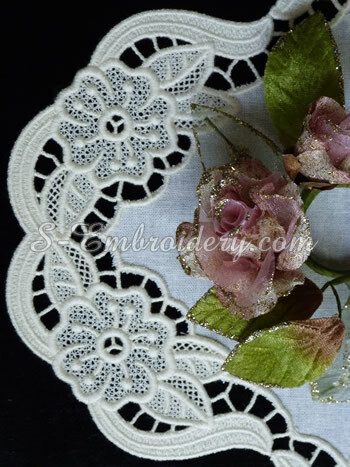 This machine embroidery design set includes 4 parts, which are used to assemle the lace doily. 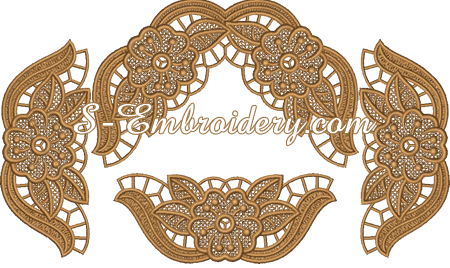 You receive 4 machine embroidery files and 2 PDF files with design information and instructions. and that design size will fit in the working area of your machine's hoop . 2. Delivery is made by E-mail only. Designs will be sent as file attachments as soon as possible. Subject to time difference delivery may take up to few hours. New Reindeer Christmas window decoration.